Stop imagining how much fun you will have with your off-road toys, and load up this travel trailer to hit the dunes. Once at your destination, you can easily set up the inside before taking off with your toys. The rollover sofa and free standing indoor/outdoor table allow you to dine and chill out while watching the 32" HDTV. 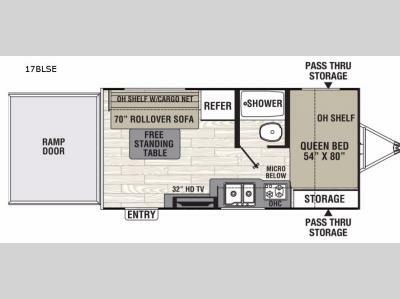 You can get cleaned up in the private shower and toilet room before falling asleep on the 54" x 80" queen bed. You will find plenty of storage for your gear on the shelves, inside the cabinets, and outside in the pass-through compartment. You can even make meals if you like. 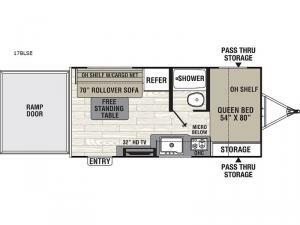 Step inside, and start imagining where all you will take this toy hauler. The Freedom Express Blast by Coachmen RV offers this toy hauler travel trailer for your four wheelers, motorcross bike, or even a Fat Boy. You will enjoy a smooth ride from the EZ-Lube axles, four season of traveling with a heated/enclosed underbelly, kitchen and bath amenities, plus many more inside features making this the perfect toy hauler. Come choose this Select Value package model today!